This year’s Spelling Bee is dedicated to the memory of champion speller and avid reader, Suzanne Bailey. 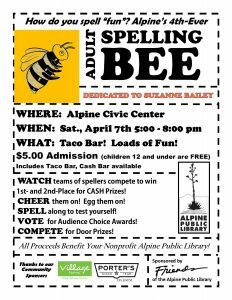 The 4th-Ever Alpine Adult Spelling Bee will be held on Saturday, April 7 from 5 pm to 8 pm at the Alpine Civic Center, doors open at 5 pm. We will have celebrity judges, the taco bar (included with team registration), and lots of fun. Cash prizes for the first- and second-place teams and door prizes will be given away during the event. Team registration is now open. Entry fee is $150 per team and teams may have up to four spellers. For more information call 432-837-2621. Spectators are welcome to join the fun. The $5.00 admission fee (children 12 and under are free) includes the Taco Bar. A cash bar will also be available. Make a team and participate or come watch teams of spellers compete to win 1st- and 2nd-Place for CASH prizes. Spectators can cheer them on, spell along to test yourself, vote for audience choice awards and win door prizes!